Our focus in this article is to achieve the connection between your Fusion PBX server, and our Mission Control Portal. We will describe a sample configuration of the INBOUND and OUTBOUND trunk. Your trunk is ready to go on our side! We can move forward with the configurations on your Fusion-PBX. 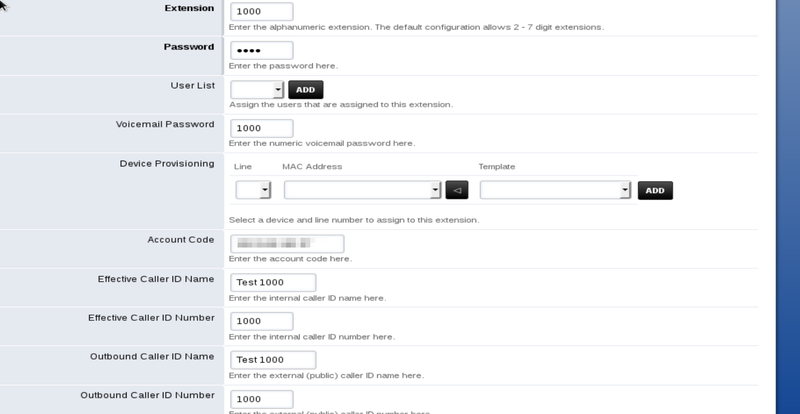 The configurations are shown in a step-by-step manner with screenshots. We recommend using Debian as the operating system version that should be running Fusion-PBX. The current Debian version that we tested Fusion-PBX on was Debian-8.6.0. Please visit this link to download any version of Debian. Use a tool called PuTTy if you want to log in remotely to the server that is hosting the content otherwise if you are installing it locally bring up the terminal and make sure you are root. If you are installing Debian from scratch it will have prompted you during the installation phase to have created a root password. This will be the password you will enter when you run the command "su root" in the terminal. Visit this website where FusionPBX recommends that you follow the install script as it is much simpler and faster than previous ways. At the end of the install script you will be instructed to go to the IP address of the server in your web browser to finish the install in the Fusion-PBX GUI. Once you have opened a browser with the URL the terminal gave you, you should see a GUI where you will go on to configure Fusion-PBX. Your event socket settings will be automatically detected so you can click next again. 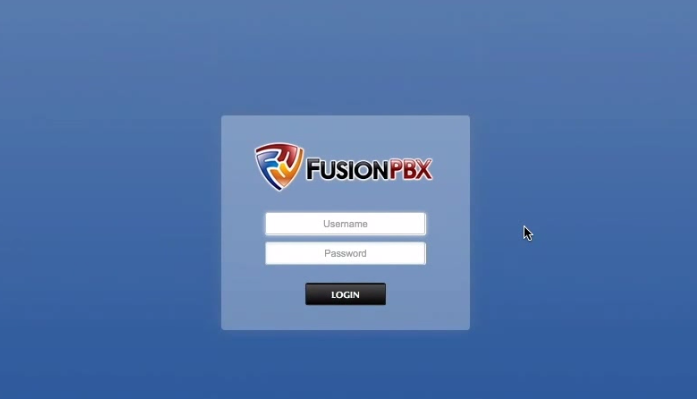 Here you will need to enter in a username and password as your login credentials for FusionPBX. Any writing in bold indicates that you must fill it in. At this point you will need to go back to the terminal and grab the details you would have seen, just above the server IP, that relate to the database username and password. Click next. You'll be brought back to the login page where you will sign in with the username and password from the screenshot number 4. Once logged in go to the Advanced header and to Upgrade in the drop down list. Make sure to tick App Defaults and press the execute button on the bottom right. Go to the Accounts header and select Gateway. Username = Username from the Registration Connection you made on your portal account like in the video above. Password = Password from the Registration Connection you made on your portal account like in the video above. From User = The username of your connection. At this point you can click save. The next screenshot will show you that your Fusion-PBX server has registered with our domain. Go to the Accounts header and select Extensions. You will need to click the Add button to add your extensions in, I have added two extensions below. Go to the Dialplan header and select Destinations. Click the Add button to add your destinations. You'll want to add in a number that you purchased on your Portal account to Destination - Make sure to add the +1 in front of the number. Then for Actions, select an extension you created from the drop-down list. Click save. Go to the Dialplan header and select Inbound routes. Your inbound routes should be added automatically that relate to your destinations you created. When you click on any of the numbers you created as inbound routes you will see a dialplan like the picture below. You will need to make sure that your number format is set to E164 on your connection you created in your Mission Control Portal. 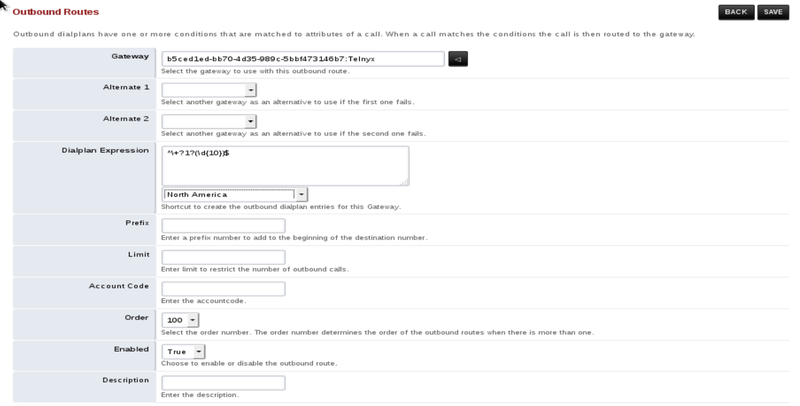 Go to the Dialplan header and select Outbound routes. Click the Add button to create your different outbound routes. Dialplan Expression = North America from drop down list but you can choose other types also. Go to the Status header and select Registrations. At this point you will need to register the extensions you created with whatever device you choose. In my case I used Zoiper and Xlite softphone to register both my extensions. All your registered devices will show up on the registrations page below. Both extensions are registered with the servers IP address so they can now make and receive calls internally via calling 1000 or 1001. Your inbound and outbound routes are set and you will be able to make and receive calls externally also.